Hotel Costa Verde (Costa Rica) – This vintage 1965 Boeing 727 airframe sits in the jungle canopy of Costa Rica. It’s been transformed into a luxury hotel suite. 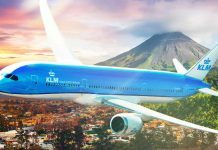 QCOSTARICA TRAVEL – The Costa Rica hotel, Costa Verde, stands out in the CNN list of “12 hotels you won’t believe actually exist”. 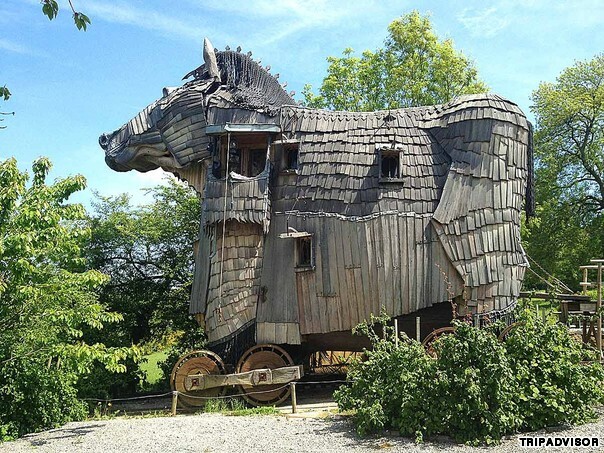 Tammy Kawn of CNN says the list is from TripAdvisor’s list of quirky places to stay redefines the phrase “unique sleeping experience”. The Costa Verde, Manuel Antonio, Quepos and locally known as the “hotel avion” (airplane hotel), is unique in that its luxurious rooms are inside a modified Boeign 727. The hotel bought the retired aircraft which in its prior life shuttled globetrotters on South Africa Air and Avianca Airlines (Colombia), and transported it from San Jose international airport the Pacific coast. It’s been refurbished and transformed into a luxurious hotel suite that sits on a 50-foot pedestal. Guests can enjoy top ocean and jungle views. For the story of how they got the airplane to Quepos from San Jose, click here. 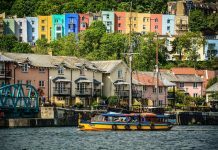 The photo gallery, documented by Tripadvisor, shows hotels located in various latitudes. 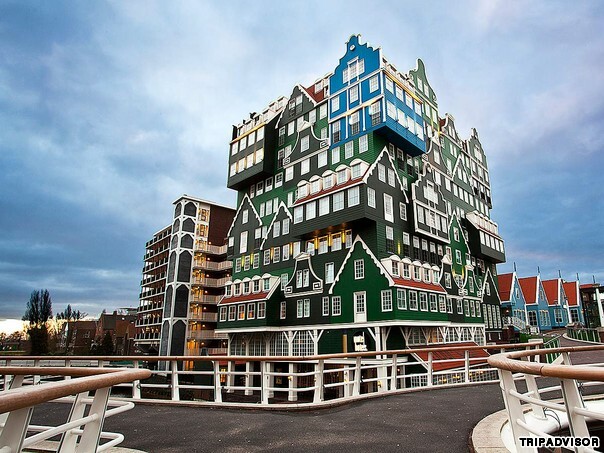 Innel Hotel Amsterdam Zaandam (The Netherlands) – Inspired by the architecture of traditional houses of the Zaan region, the green facade of Innel Hotel Amsterdam Zaandam is eye-catching even from afar. 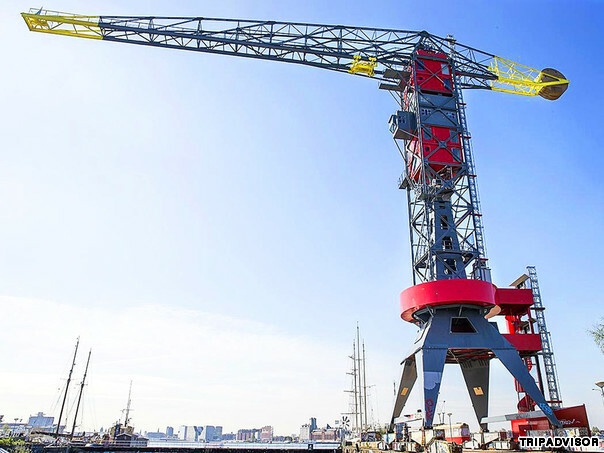 Faralda Crane Hotel (The Netherlands) – If staying atop a former industrial monument isn’t exciting enough, you can attach yourself to a rope and free fall 164 feet from the top. 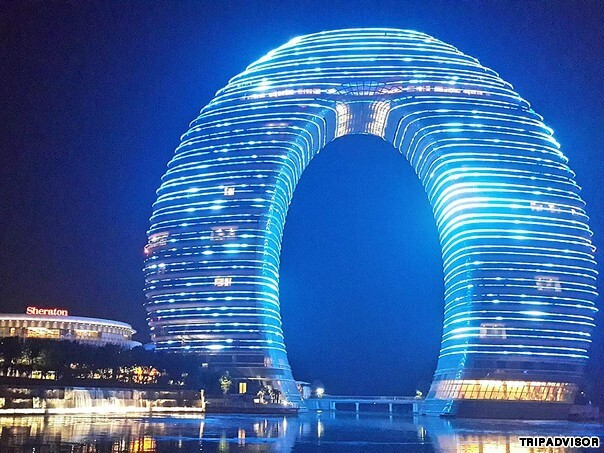 Sheraton Huzhou Hot Spring Resort (Huzhou, China) – An underwater bridge connects the hotel’s two towers. 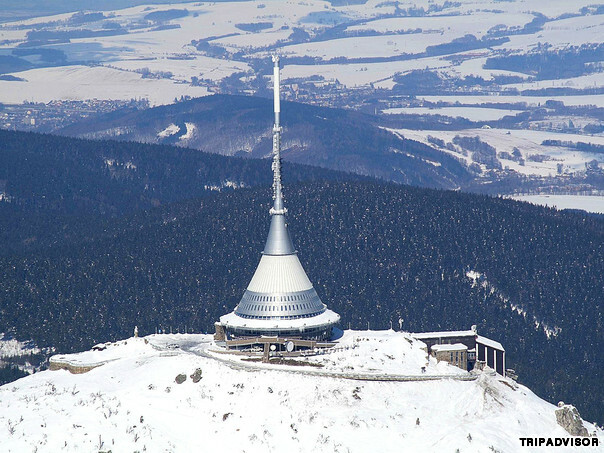 Hotel Jested (Czech Republic) – Built in the 1960s, this hotel looks more like something from a sci-fi movie than a place to spend the night. 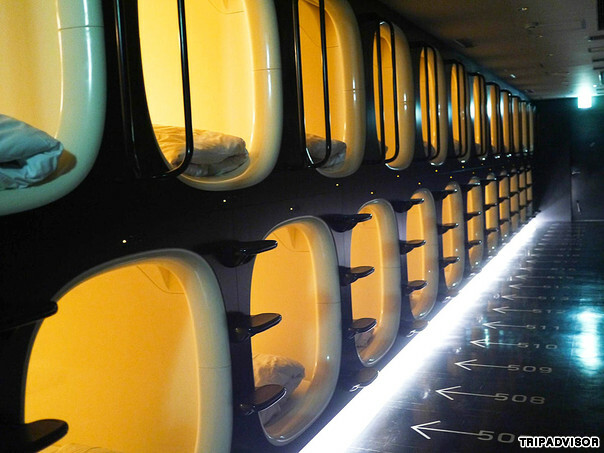 9 Hours Capsule Hotel Kyoto – Inside each sleeping pod is an ambient control system, said to help you sleep better. 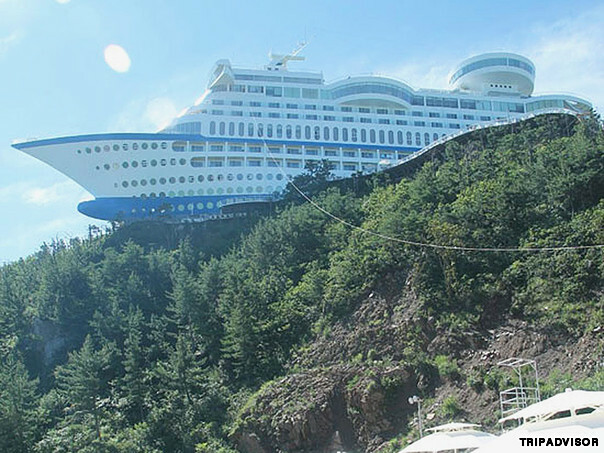 Sun Cruise Resort (South Korea) – Billing itself as the “first luxury cruise ship on land,” this resort offers everything you’d experience on the open sea — minus the sickness and ports of call. 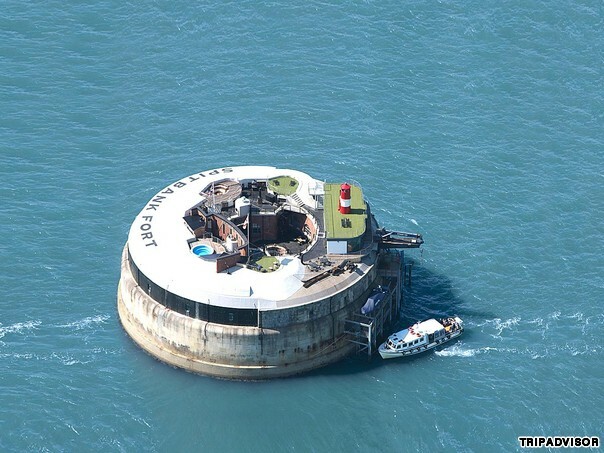 Spitbank Fort (England) – This hotel has been transformed from a gun emplacement into a luxurious private island fitted with a rooftop heated pool, sauna and fire pit. 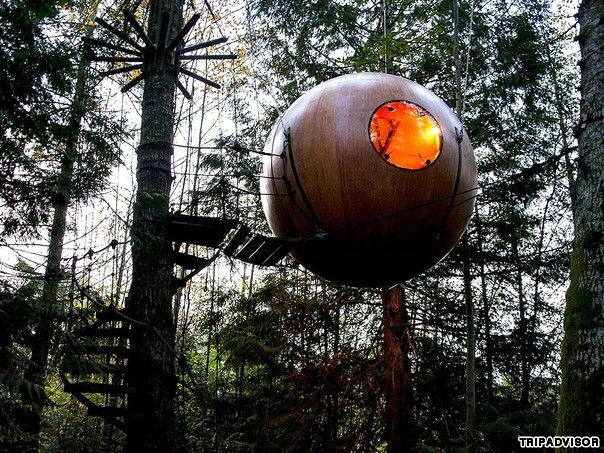 Free Spirit Spheres (Vancouver Island, Canada) – There are tree houses for kids, then there are tree houses for adults. 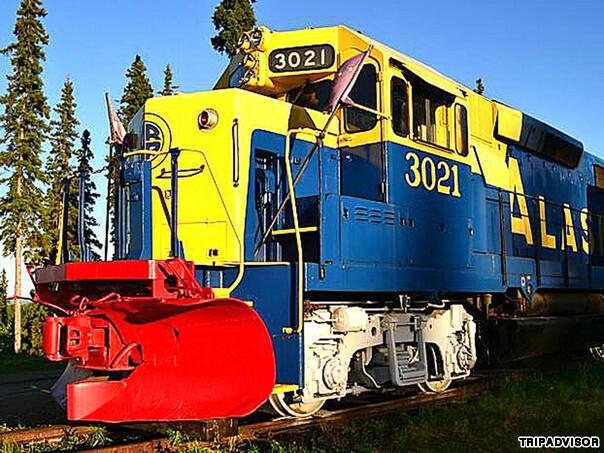 The Aurora Express (Fairbanks, Alaska) – The cars of this train sit on 700 feet of railroad track overlooking the Tanana River, Alaska Range and city of Fairbanks. 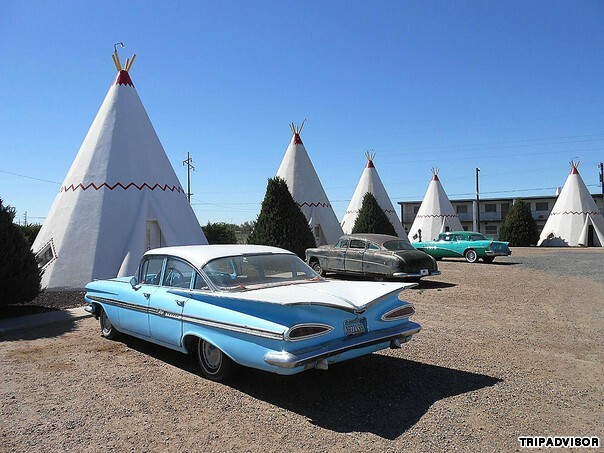 Wigwam Motel (Holbrook, Arizona) – Influenced by Native American culture, Frank Redford began building these teepee motels across America in the 1930s. Only three remain. La Balade des Gnomes (Belgium) – La Balade des Gnomes looks like an odd farmhouse but it’s actually a hotel with 10 guest rooms. 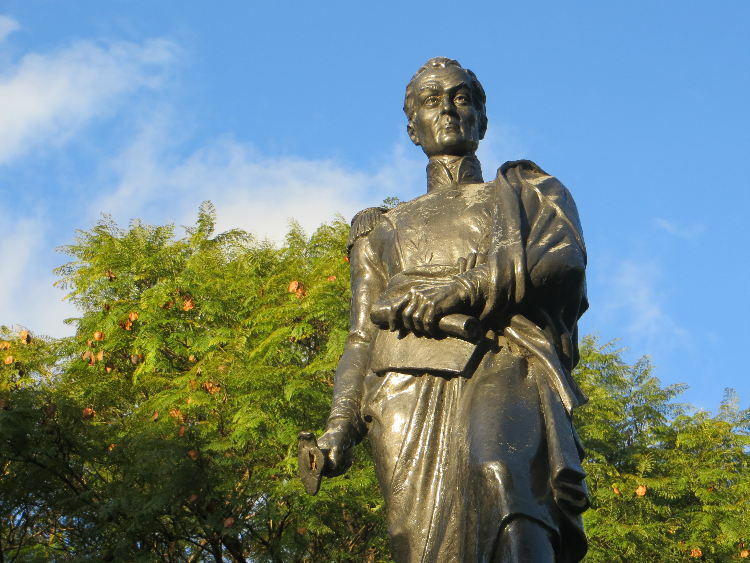 Who Ripped Off The Liberator’s Sword?